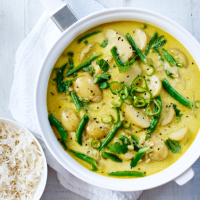 A simple curry using the best of Britain’s spring harvest. 1. Heat the oil in a large saucepan or casserole dish and cook the onions over a medium-high heat for 5-7 minutes, until soft and golden in places. Throw in the ginger and ½ the chilli, then fry for 2-3 minutes, until fragrant. Add the nigella seeds and curry powder and fry for another minute. 2. Tip the potatoes into the pan with 650ml water, then cover and bring to the boil. Simmer briskly for about 18 minutes, until just cooked. Add the green beans and simmer, covered, for another 4-6 minutes, until tender but still bright green. 3. Stir through the yogurt, lime zest and juice; season. Serve scattered with the mint leaves and remaining chilli, plus some steamed rice or naan bread, if liked.